Yesterday (after the Mojo concert, see previous post) I managed to catch a rare visit by the old steamboat SS Östersund to the harbour of the city that bears the same name (Östersund). Lake Storsjön (The Great Lake) is the fifth largest lake of Sweden and a hundred years ago there was plenty of traffic in these waters. 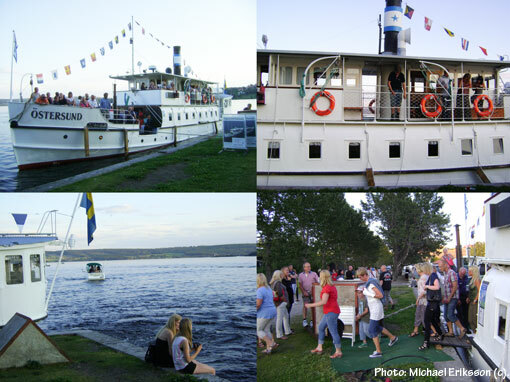 Only two of the classic steamboats have survived, SS Thomée (mentioned before on this blog) and SS Östersund. This beautiful boat was built in 1874 and saw traffic in the lake until 1963 when it was put out of business. Enthusiasts saved the boat and by 1989 it was in traffic again, now from the harbour of Arvesund (where a fantastic museum is located). It now operates during the summer months, June to September. The Great Lake Monster has been sighted from these steamboats on several occations over the decades, there are cases in the archives. A mysterious film was taken from SS Thomée in 1996 by Gun-Britt Widmark that I helped to rescue from VHS format to DVD last year. It is being kept in the archives of Föreningen Storsjöodjuret (a local interest group that I have mentioned before). The Great Lake Monster was sighted in the harbour of Arvesund not long ago – see earlier post (and full story in RETROFUTURE 6).